Pallet furniture ideas have a big number of fans and all famous across the globe! 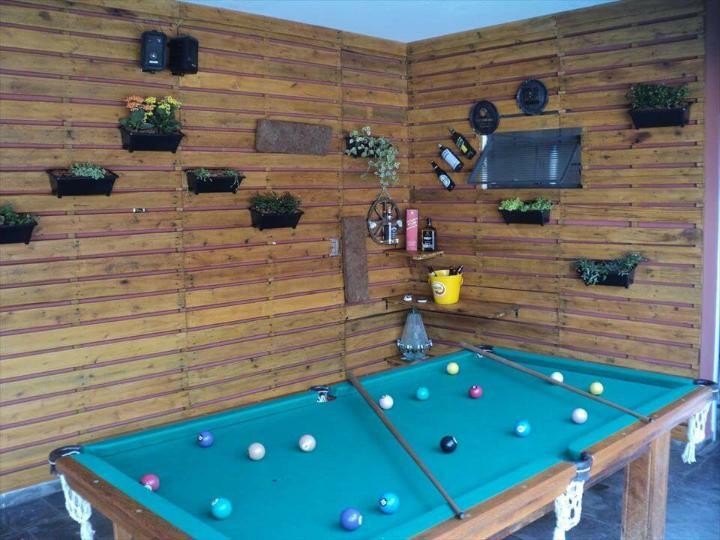 Now we are with more insanely clever pallet wood ideas and strategies which are all about how you can better performing, super functional and accent wooden walls out of pallets! These DIY pallet wall paneling ideas would explain everything you can do with your to your interior wall for an accent look and a super functional behavior! Break the pallets into separate slats and then plan them for pallet wall decor or paneling, this would be highly cost-effective and hardwood nature of pallets would keep the wall longer stable and rocking! Also build the wall hanging media stands, accent shelves and organizers by using both original pallet boards and dismantled pallet pieces! Get yourself inspired of given below suggestions and give some cool effects to your both exterior and interior walls and also to garden walls! 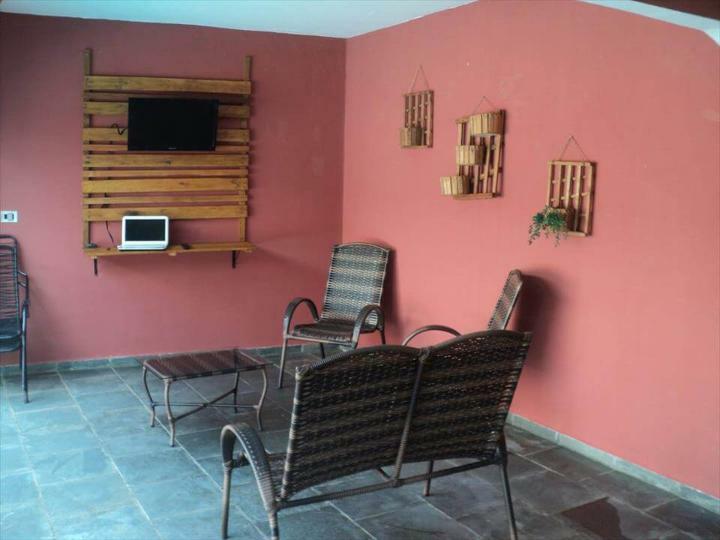 In this cost-efficient pallet exterior improvement project, total 3 walls have been given an amazing wooden touch through pallet wood wall paneling and also a wall hanging TV stand has been created for poolside TV lawn! 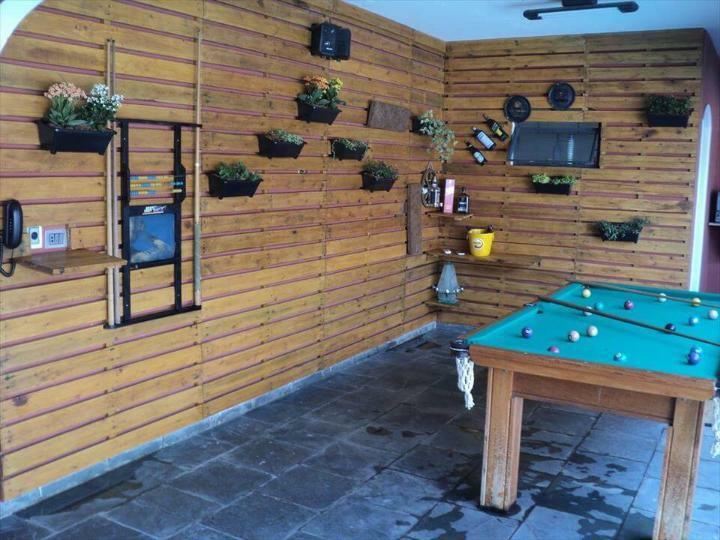 Using nothing but pallet wood slats, this whole wooden wall has been installed, this wall belongs to a poolside and the area is also having a game pool! 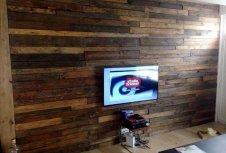 Pallet-made panels and individual pallet slats can both be installed to gain this wooden accent wall! 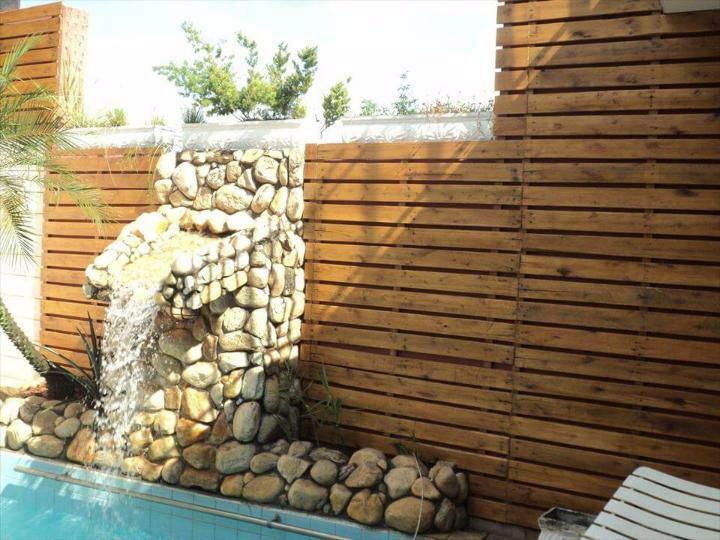 The whole wood wall has been installed using very little amounts of money and the benefits are really never ending! 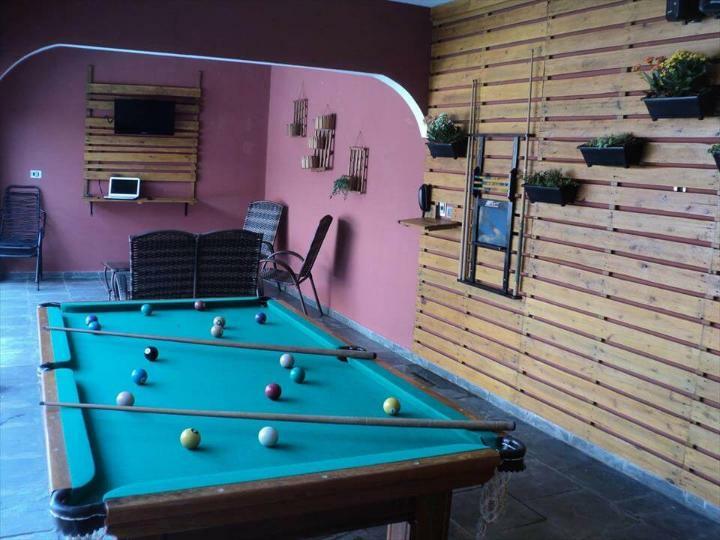 Wood medium of will allow to add further hooks for hanging purposes, to install shelves for display purposes and also some other custom setups like frame for pool game sticks! Drink bottle rack, some fab corner shelves and some hanging wooden baskets have also been installed to this accent wood wall! The wood adds warmth and coziness to whole wall! 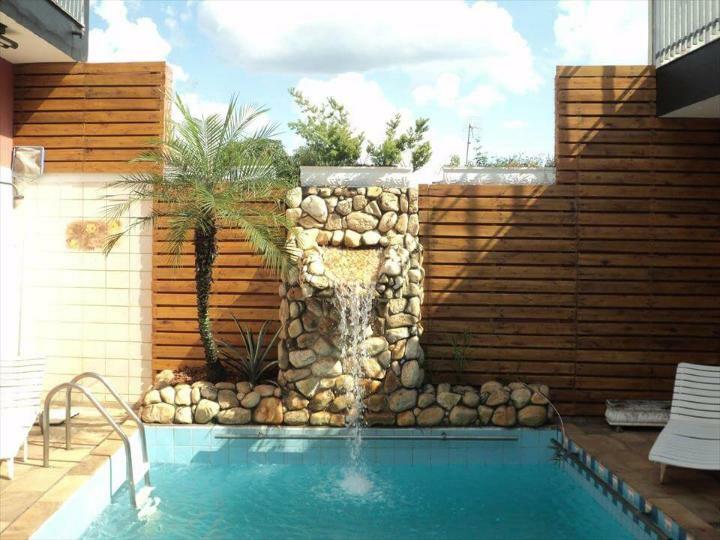 The front pool wall has also been paneled with pallets and look cool enough to captivate the eyes of onlookers! You can simple removed the dice section and can install those modified pallet units to install full wooden wall! The 2nd method is usual wall paneling which can be done using removed pallet planks one by one! The fine boundary lines and simple straight arrangements just create the fab look of whole wood wall that hold much precious to eyes! Stain and paint can be brilliant options if you intending to personalize the total hue of the wall or a partial area! You can take pallets as prefabricated pallet panels which can be installed to give an targeted wooden area a specific wooden touch, a texture and an extra support! You can do the same to interior walls for a dignified look and wood will also help you to insulate the room interiors by going in the same way! A bigger pallet skid has been modified and has been extended to gain a shelving level! 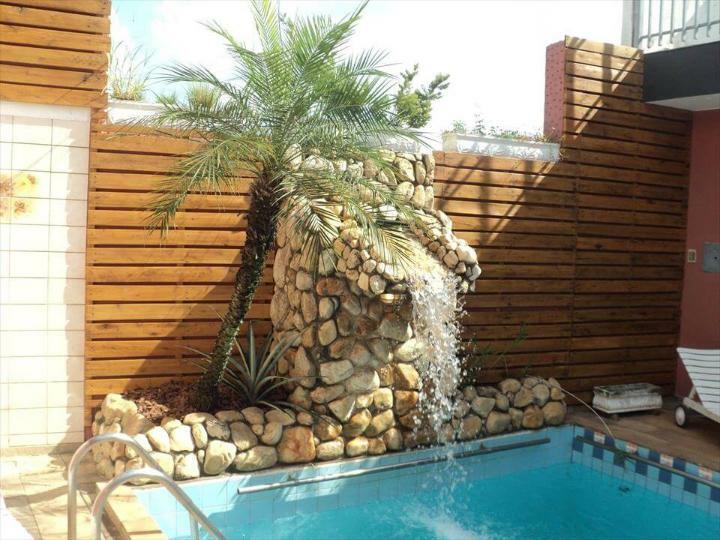 It has been installed to a poolside wall as a wall hanging TV unit which makes a brilliant TV lawn there! Here is how the pallets can be adapted to develop and improve your living spaces!